Grading on a curve a bit because, while I think Gail Simone is awesome, Batgirl's reboot is a bit flawed. This is the first time I've read a trade and felt as if I've missed out on something significant. I know that Barbara, pre-reboot, was paralyzed. 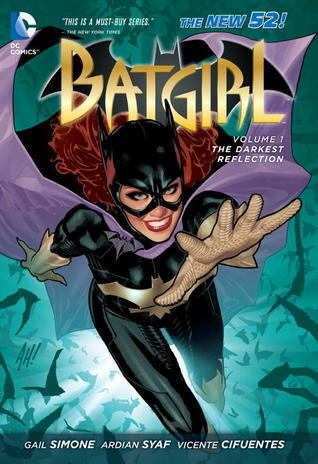 She's recovered in this one and is Batgirl again, which a) I can accept and b) I get why others have issue with it. There's just a lot of background that's just assumed that I had a hard time following here. With that said, there was a lot to like here as well once I got past being a little lost. Of course, it doesn't hurt that Gail Simone is awesome, but the writing is really stellar. That alone will make me want to jump on the second volume when it's available. I'll just come right out and say it - this is a total Avenger-ization of the Justice League, and I'd accuse it of being an outright ripoff of the films had these individual issues not come out a year before. With that said - awesome. * Green Lantern, who's snarky and witty in ways I didn't really gather from the Darkest Night trade from a while back, and clearly fills a Tony Stark role here. * Batman, who is Batman. * Superman, who is really angsty and misunderstood, which I didn't expect and actually makes me want to rush out and get the New 52 versions soon. 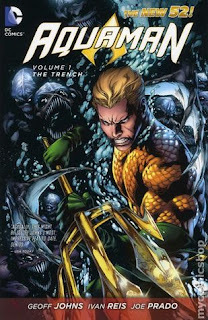 * Aquaman, who's highlight is getting a giant shark to eat an alien. Sigh. * Wonder Woman, who goes full Thor in this one, with the Frozen Caveman Lawyer mannerisms and kind of fun and goofy all at once. Needless to say, I really liked this Wonder Woman. * The Flash, who I believe is at fault for all of this and is more or less reduced to a "nyah nyah I'm fast" thing, which...I dunno. I don't get the Flash. * Cyborg, who I had never heard of prior to this. I mean, it's kind of fun and goofy, which is a nice change from the gritty stuff that's been the hallmark of so much of the superhero stuff I'm reading lately. That doesn't mean I dislike the other stuff, but more that I can embrace the camp. It's fun! 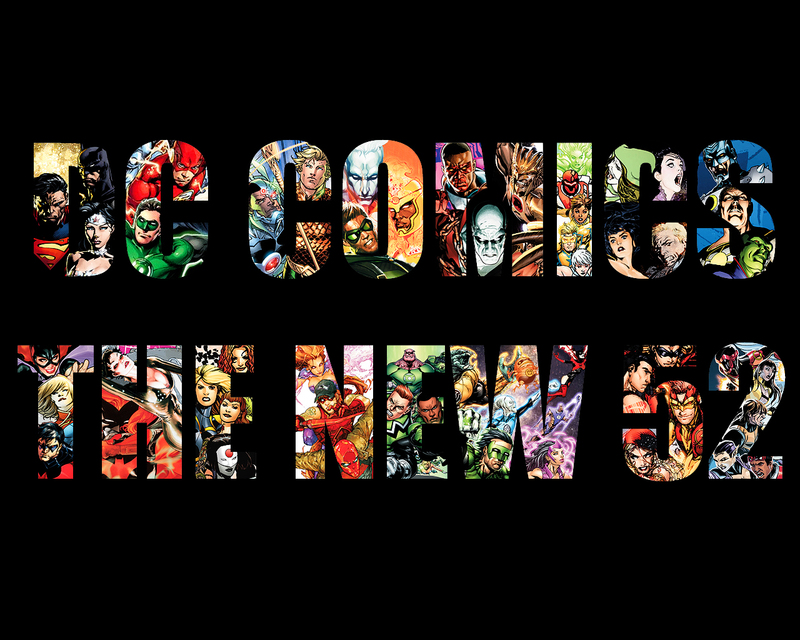 I love that the New 52 exists to kind of give this new gateway. I'm really enjoying this aspect of it. 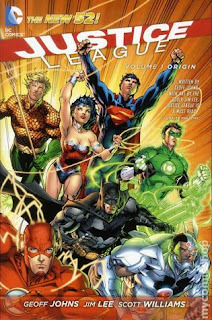 I wouldn't have normally picked up Aquaman, seeing as how few take him seriously, he wasn't that interesting in the first New 52 volume of Justice League, and my closest association in my brain is the Entourage arc where James Cameron directs an Aquaman movie. I really had a lot of fun with this one. In the off chance you've been on the fence, it's worth giving a shot. 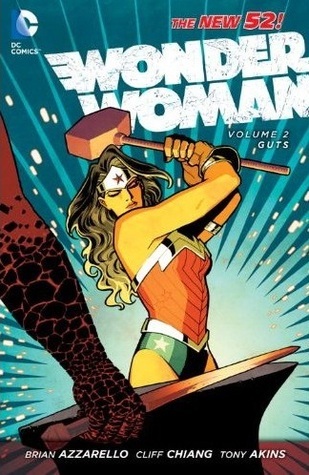 As a big fan of Wonder Woman, the New 52 trades were at the top of my list. 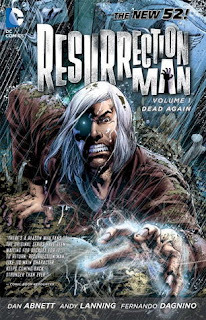 With the first volume, I started out extremely torn about the reboot, and I'm not sure if it's because the author positioned it as a horror comic and, well...it's not? I certainly didn't get that vibe from it, and when you have an actual horror comic like Animal Man to point to, it's a different story. Regardless, this is a reboot in the thinnest sense possible. The storyline would fit right in with some of the existing previous arcs, but is a decent refresh nonetheless. The problem, again, is that Azzarello really doesn't seem to know what he wants to do with the character in the first volume. The result is an interesting, mythology-heavy arc that is fun but not entirely memorable. It may be asking a lot in the first six issues of a reboot of what is an iconic character, but I think I was expecting more. Thankfully, this got repaired rather quickly by the end of the second volume to the point where I can now say that I was completely wrong. This works because Azzarello understands that Wonder Woman is steeped in mythology, as opposed to it being a vice or roadblock, and Azzarekki succeeds by not letting mythology bog the story down. We get the ancient gods in full force, but they're more modern as you'd expect. 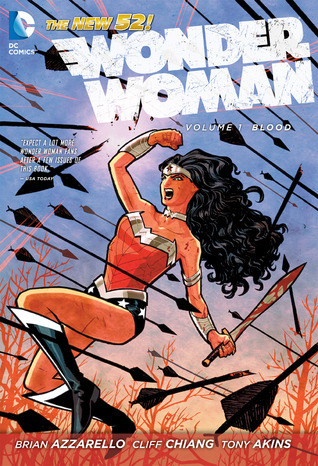 Plus, there's the added bonus of wondering what Wonder Woman's growth was like between the Year One Justice League and now. I just love everything about it at this point, and it almost makes me sit here and say "this is why I suffered through so many subpar Wonder Woman arcs." Azzarello gets it. I loved the first Animal Man trade, as I linked above, and upon finishing volume two, I walked away thinking, quite simply, that Jeff Lemire is a genius. 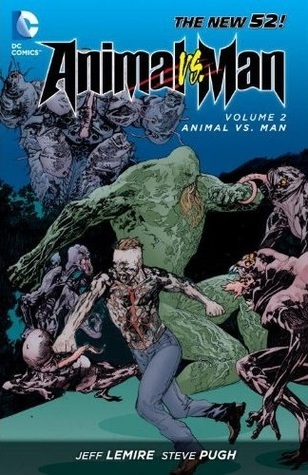 The newish incarnation of Animal Man continues in this second volume with the battle between the red and the green escalating significantly, with the life of a little girl in play, and with an appearance by Swamp Thing. The artwork is spectacular, the writing a perfect balance between weird and scary and interesting, and nothing really comes out as predictable. It's near perfect, and Animal Man has effectively locked itself in as my favorite of the current New 52 arcs. An extra bonus was the Buddy Baker "origin story" toward the end which was a pleasant surprise to go along with it. The next trade can't come out soon enough. Resurrection Man does what it says on the tin - he dies, he resurrects. He's got people looking for him. There's an issue with his soul. He's not so sure of himself, he only knows what power he has when he wakes up. And so on. A little confusing? That's this arc in a nutshell. Confusing, I'm not convinced very necessary, and, truly I don't know if I actually get it. I might try the next trade if I can find it, but this is the first of the New 52 I could honestly say puzzled me. 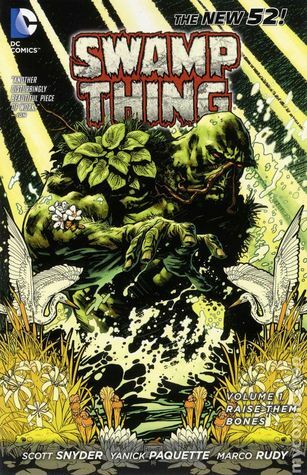 After reading Scott Snyder's superlative first Batman trade for New 52, The Court of Owls, I ran to grab his run on Swamp Thing. 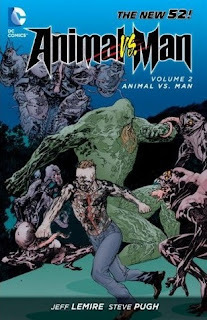 I have no real history with Swamp Thing on a whole outside of consistently confusing him with the Toxic Avenger, but I didn't know Animal Man, either, and that worked out well. Raise Them Bones, unfortunately, is pretty much a disheveled mess, all things considered. While I'm not sure that having more knowledge of Swamp Thing would have necessarily helped, it actually (maybe somewhat ironically) reminded me of Alan Moore's Promethea at times, with some extremely esoteric artwork and confusingly epic scenes. I don't believe this necessarily to be the fault of Snyder, but the artwork wasn't poor, either, so it must have been just a rough situation all around. I can't really explain it. While there have been New 52 entries that I've been ambivalent toward, this is the first one I really didn't care for on any level. The critical acclaim for it seems to be in place, so it's clearly just me, but I would recommend skipping. Coming soon: thoghts on Green Lantern, Justice League Volume 2 and Justice League Dark, Earth 2, and more!